Professional carpet cleaning services are very important in enhancing durability of a carpet and maintaining its impressive appearance. Unfortunately, there are myths that have made some homeowners in Singapore go for long durations without cleaning their carpets. Below are some of the common myths or misconceptions about cleaning a carpet and real facts. 1. A carpet that is one or two years old does not require cleaning. This is among the most common myths about cleaning a carpet. Many homeowners believe that a carpet should not be cleaned until when it start looking dirty. However, this should not be the case. This is because by the time a carpet start looking dirty, dirt will have already caused damage to the fibers of the material used in its manufacture. Regular cleaning will prevent this damage from occurring on your carpet. This is not true. Outdoor environments contain bacteria, fungi, pollens, smoke from cars and cigarettes among other pollutants. When you get into your house, you carry them with you on your skin, hair, shoes and clothing. Most of these elements end up accumulating in the carpet. As such, cleaning your carpet is important not only for removing dirt, but other contaminants as well. 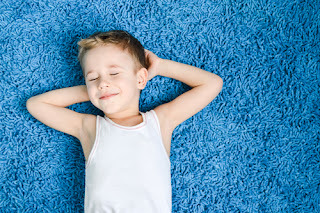 Regular carpet cleaning helps in preventing allergies, emphysema, asthma and other respiratory problems among your family members and visitors. Some homeowners think that as long as they have a carpet cleaning machine in their homes, they can clean the carpet on their own. Unfortunately, this is not a good thing to do to your carpet. Using these machines leave a carpet with excessive water that is hard to extract. Drying your carpet may take several days during which it will be open to mildew, mold and premature breakdown. Your carpet will also look dingy and dull prematurely because using these machines causes soap residue to build in it. This is a misconception. There are many companies that have hot-water cleaning equipment but only few of them have trained professionals who can use them properly. Therefore, choose a company to clean your carpet carefully. The best company has trained professionals who knows how to use appropriate cleaning equipment properly. This is not true. Some companies use low prices to lure homeowners so that they can hire their poor cleaning services. A company that gives you the cheapest quote via an advert may not deliver the kind of services that you want. Others may not be advertising the actual price that they charge for their services. Their services come with add-on charges. Therefore, take time to find a company that charges a reasonable price for the best quality cleaning service. This will ensure that the right chemicals and methods are used in cleaning your carpet. Basically, if you want your carpet to last long and maintain its original look you should have professional cleaning services on regular basis. A professional provider of cleaning services will listen to you and clear doubts that you may be having about carpet cleaning.